"Be lighthearted and hopeful for the fall," Ryan said. 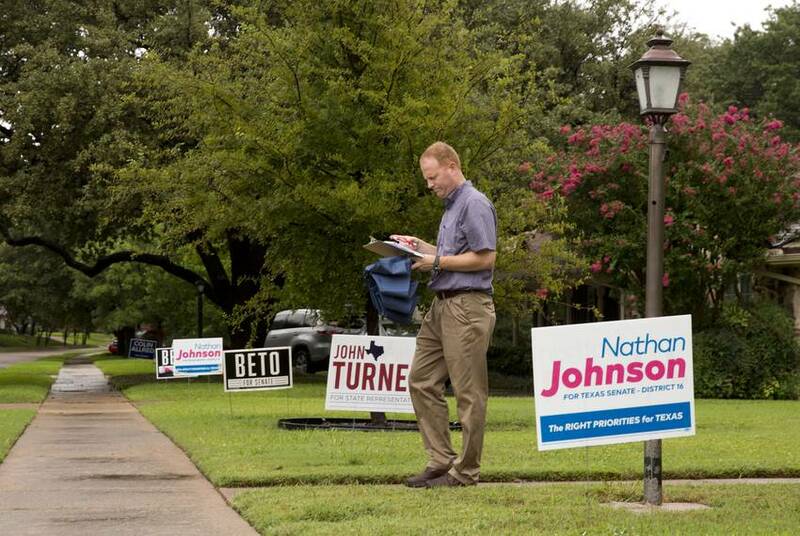 "Because for every Beto sign there’s two to three Republicans out there that just haven’t put their (signs) out yet." Shouts and cheers bounced off the walls of Ryan’s home. "We’re going to win this,” she said. House District 114, which encompasses North Dallas, has been in Republican hands for years, but it's now a battleground district — Hillary Clinton beat Donald Trump by 8.9 percentage points in 2016, sparking Democrats' hopes that they can flip the district in this election cycle. Ryan, a staunch conservative and first-time candidate, beat a relatively moderate three-term incumbent, Jason Villalba, R-Dallas, in the GOP primary to become the district’s Republican candidate. Next month she'll face Democrat John Turner, a Dallas lawyer and also a first-time candidate. Jeff Dalton, head of the Dallas County Democratic Coordinated Campaign, said the 114th was drawn in 2010 to make it a safe Republican district, but he thinks energy on the Democratic side can overcome that disadvantage. Local Republican leaders say Clinton's margin at the top of the ticket has made Democrats overconfident. They point out that in 2016, Villalba beat his Democratic challenger by 15 points while Republican U.S. Rep. Pete Sessions — whose Dallas district includes the majority of HD 114 — won 71 percent of the vote against Libertarian Ed Rankin and Green Party candidate Gary Stuard. "I love when Democrats think they’re going to win because of that math," Dallas County GOP Chair Missy Shorey said. Ryan, a 57-year-old entrepreneur and businesswoman, has excited a Republican base that had soured on Villalba. "He was pushing an agenda that was very much in line with a Democrat agenda,” said Ryan supporter Tiffney Pratt, who was block walking for Ryan last month. "It wasn’t a Republican or conservative agenda. He was a fake conservative." Although some, including Villalba, have characterized her as a hard-right conservative out of step with the district's voters, Ryan doesn’t embrace that label. Ryan has said that although she may not agree with everything Trump does, she still favors his policies. Ryan has received endorsements from GOP heavyweights including Gov. Greg Abbott, Texas Attorney General Ken Paxton and Sessions. As the owner of five local businesses, including her well-known interior design business Lisa Luby Ryan Design and Build, Ryan has built a name for herself in North Dallas. As spokesperson for the religious nonprofit I Am Second, she’s shared her story of childhood abuse and previous abortions through the organization’s media platforms and through various speaking engagements. Ryan’s involvement in the Dallas County Republican Party goes back about 20 years. She's worked on George W. Bush's gubernatorial and presidential campaigns, as well as campaigns for Sessions and former House Rep. Dan Branch. From 2005-06, she served as president of the Park Cities Republican Women, which she said she helped grow to the second largest club in the state. "I’ve worked on everybody’s campaign but my own,” she said. Meanwhile, Turner believes his moderate appeal will help him attract voters from both ends of the political spectrum. It’s this same kind of message that Turner’s father, Jim Turner, used when he served as a state representative, state senator and later U.S. congressman from the 1990s to the early 2000s. Turner, 43, said he was inspired to run for office after four years of representing 88 property-wealthy school districts who sued the state over its school finance system in 2011. The districts argued Texas was not adequately or equitably funding public education, and was relying too much on local property taxes to pay for schools. The Texas Supreme Court ultimately upheld the state’s funding system in 2016, but Turner gained popularity among public school advocates — both Democrats and Republicans — and has made public school financing one of the main issues of his campaign. Ryan and Turner differ on where funding for public education should come from —Turner has alluded to using money from the state's $10 billion "Rainy Day Fund," while Ryan has opposed the idea on the grounds that the fund should only be used for state emergencies. "That fund is an important savings account for the state, but there’s no reason it should have that much in it,” Turner said at a candidate forum hosted at the North Dallas Chamber of Commerce. 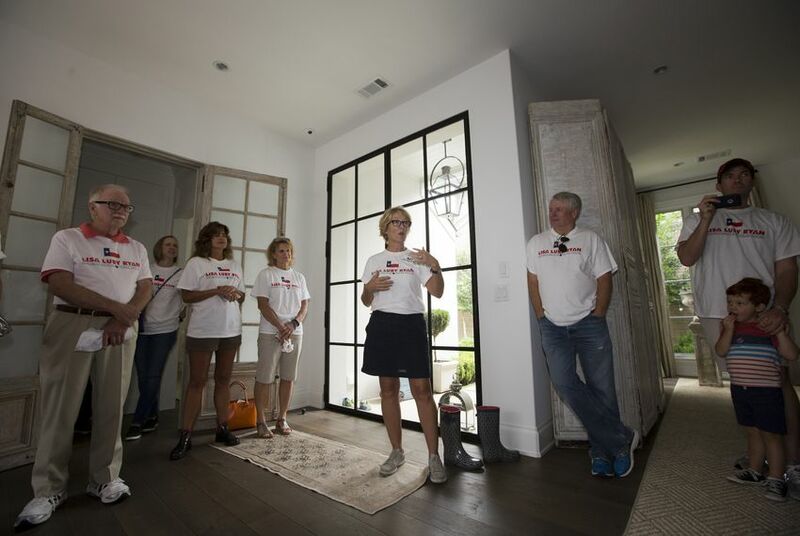 Turner’s centrist approach has attracted a slew of bipartisan backing from Dallas Independent School District trustees, the Texas Association of Realtors PAC and the Texas Association of Business PAC. With election day quickly approaching, Turner said he believes his campaign is in a good position. Ryan said she and Turner have maintained a respectful tone during the campaign. At a candidate forum earlier this month, the candidates consistently found common ground despite disagreeing on many issues. "People are looking for a greater level of just general civility and decency in our politics," Turner said. "We need to do our best to make this a year where we get away from a politics of name calling and divisive rhetoric and try to focus on what government is supposed to do." Disclosure: The Texas Association of Realtors and the Texas Association of Business have been financial supporters of The Texas Tribune, a nonprofit, nonpartisan news organization that is funded in part by donations from members, foundations and corporate sponsors. Financial supporters play no role in the Tribune's journalism. Find a complete list of them here.